Defence Minister Guto Bebb has today announced the delivery of the first of a fleet of new helicopters designed for Royal Marine aircraft carrier operations. The helicopter, known as the Commando Merlin Mk4, has been upgraded to a faster and more powerful aircraft than its predecessor. It now sports a maritime grey coat, has a folding main rotor and tail, upgraded flight controls and a tactical computer. The modifications are designed to ensure it can now operate from sea, and it will take off from ships including the UK’s new 65,000-tonne aircraft carrier, HMS Queen Elizabeth. DE&S Director Helicopters Air Vice-Marshal Graham Russell said: “DE&S is proud to have delivered the first Merlin Mk4 to the Royal Navy. Today underscores that DE&S and their industrial partners are delivering. And delivering more with less, thanks to our effective change programme and fantastic staff. 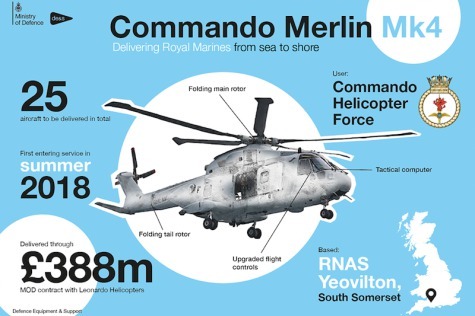 Colonel Lenny Brown RM, the Officer Commanding Commando Helicopter Force said: “Commando Helicopter Force provides aerial support to the Royal Marines, be they at sea, in an assault ship or in the sand and dust of Afghanistan.